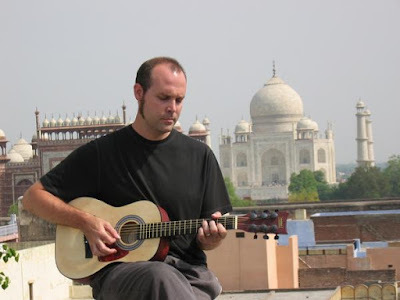 New Haven local Shawn Persinger is a composer, guitarist and singer/songwriter and has released seven critically acclaimed CDs, written two instructional music books and has performed thousands of shows in 36 different countries on 5 continents. He has been the featured artist on NPR’s “Acoustic Cafe” as well as being showcased in various national and international magazines, including: Guitar Player, The Village Voice, Guitar World and Rolling Stone. Shawn has also been a recipient of an American Composers Forum grant to develop improvisational and experimental music workshops, a Fundacion Valparasio Residency in Almeria, Spain, and a semi-finalist in the ASCAP Young Composers Competition. Shawn is endorsed by Elixir Guitar Strings and Taylor Guitars. He plays Scientist Folk, Modern/Primitive guitar and Rock and Roll. He'll be performing under the moniker Shawn Persinger is Prester John Durga Rathi at The Space on Sunday.